Yesterday I noted that 46 out of 100 Amnesty International's previous tweets as of Wednesday were about Israel. 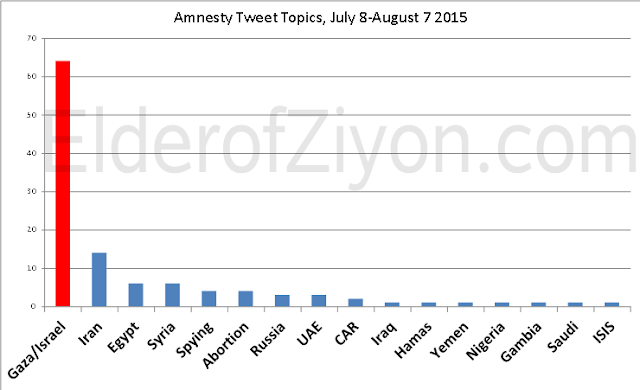 Interestingly, since I mentioned that, there have been more tweets than usual, none about Israel or Gaza. Apparently Amnesty is starting to realize that their obsession with Israeli actions from a year ago using false data looks bad. Well, it looks really bad when you see it graphically. The only other one-year anniversary I saw them tweet was a retweet about the abduction of the Yazidi girls that caused a stir a year ago. But Amnesty's website didn't mark the anniversary. Instead, it launched two separate major anti-Israel projects - Gaza Platform and "Black Friday" accompanied with press events.